Washington, DC—November 11, 2016—Central Union Mission welcomes the White House 2 White House running team for a short break before their final two miles to the White House. The twelve-member team sponsored by the Jim White Fitness Foundation and its LIFT program will start running early Sunday morning in Virginia Beach and end in Washington, D.C., on Monday, November 14, after covering 240 miles. The group will be distributing care packages at homeless shelters along the way and welcoming others to join their run. At Central Union Mission, they will meet up with Central Union Mission Overnight Guests, Spiritual Transformation Program students and staff and Back On My Feet program participants, who will join them for the last nearly two miles to the White House. This event is timed to raise awareness for National Hunger and Homelessness Awareness Week, November 12 – 20, 2016. 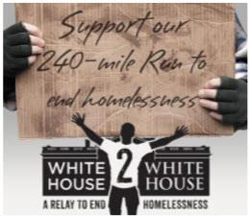 White House 2 White House’s ETA at Central Union Mission is 12:00 – 1:00 pm. Wear your running shoes, and join us for the last leg! Interviews and photo opportunities are available with the running team and homeless guests. Central Union Mission is a faith-based 501(c)(3) nonprofit. In addition to its emergency shelter program, the Mission operates a rehabilitation program for men with life-controlling issues, a clothing and furniture distribution center, a retreat and recreation center with a camp for underprivileged children and a ministry to families and senior citizens. For additional information, contact Deborah Chambers, director of strategic partnerships and community engagement, at Cell: 202-534-9965, or visit www.missiondc.org. homeless people based on physical fitness.